Yesterday, Lisa and I made our annual pilgrimage to the CABS After Turkey Day Game Fest (XIV). 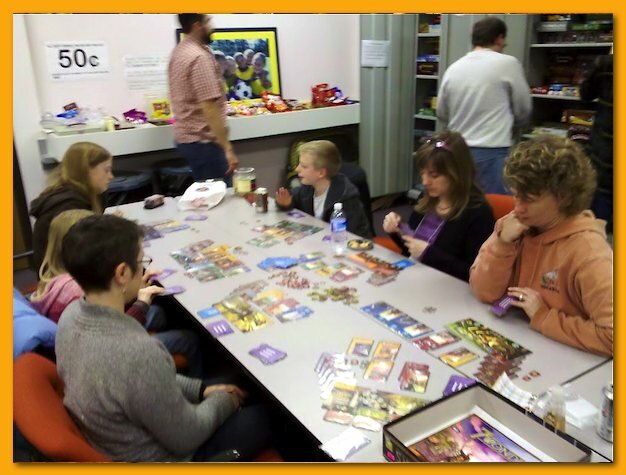 Every year, CABS allows the public to use their space for playing board games and opens the doors to their massive game library to anybody that wants to play. Come one, come all whether it be families, kids, adults, people new to games, or seasoned veterans. I apologize up front for the relatively poor images. All I had to capture the moment was my Droid crap-cam. The lighting caused some horrendous purple fringe effects. We arrived before 11am to a packed house. This year, they opened the doors at 6am Friday morning and would close down at 6am Sunday morning. I spent a few moments looking through the flea-market items while Lisa linked up with some friends who had arrived at 6am! Impulsively, I bought a used copy of Palenque, a recent Essen release. The Z-Man produced game was on my radar and my intent was to track it for a few months before making a buy decision but $20 for what currently sells for $34 at Game Surplus and what appears to be a like new copy, I figured it was worth the shot. While our friends finished up a game, Lisa and I found a couple of open spots at the end of a table and played Roll Through the Ages: The Bronze Age. 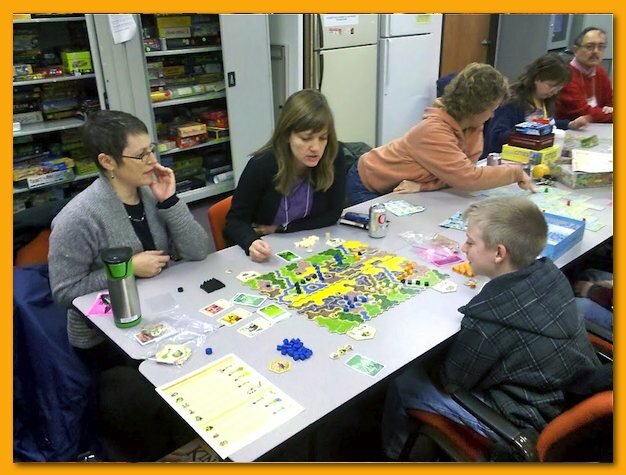 When the end of another table opened up, I grabbed Kingdom Builder from the library and taught it to everybody else. I have never actually read the rules myself but in checking on a few items when questions came up, I realized that the hut placement rules are more easily taught the way the rules describe them as opposed to how I was taught them, and that there are some special tile situations I was unaware of. 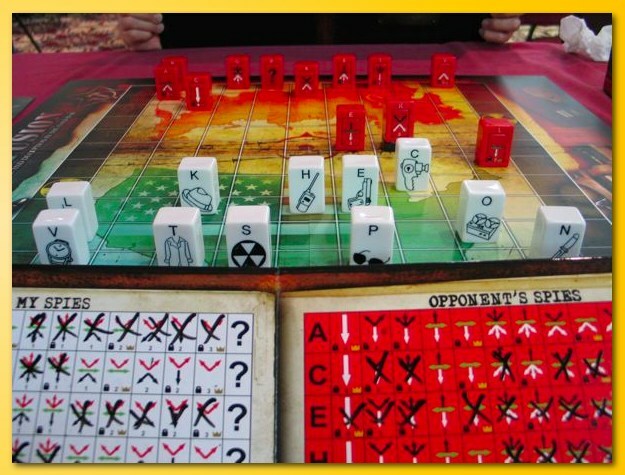 As is usual, I bore the brunt of the verbal ribbing (“Have we ever played a game correctly? !”), the burden of being the teacher I suppose. I think everybody still had a good time. It had been months since I’d played Egizia but the three of us sat down for a rules refresher (we’d all played at least once some time in the past) and a quick game. 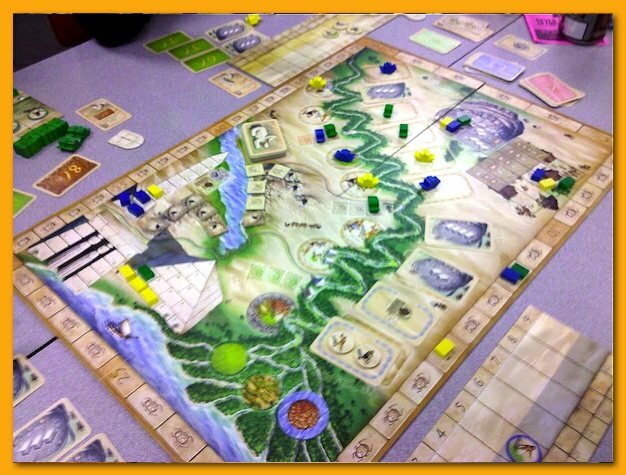 I always have a good time playing Egizia; it’s one of my favorites. 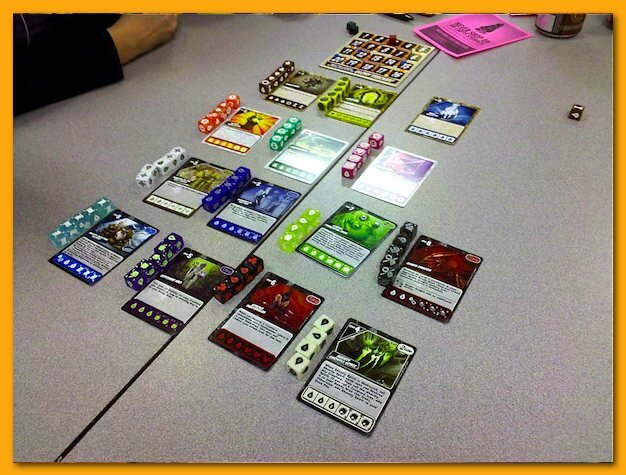 While Lisa played Lost Cities: The Board Game with a friend, I taught Quarriors to a group of three kids. I didn’t play with them but instead, just got them started and sat near to answer questions. 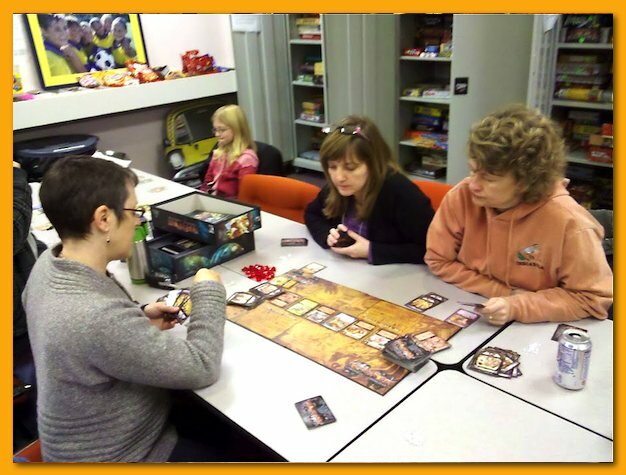 I like teaching games to others and honestly don’t mind teaching and then sitting out while they play. 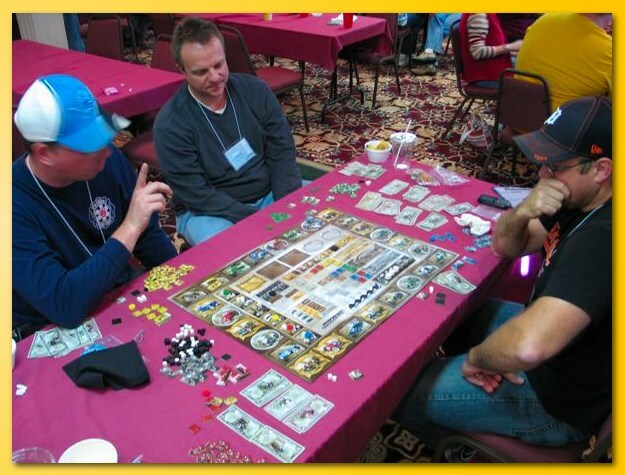 I think these public gaming events are a great opportunity to evangelize for the hobby and it might be nice to organize something a little more formal for the club. Next up was Ascension: Chronicles of the Godslayer. This was new to three of us but it was a quick study. If you’ve played Dominion, you’re set. The game is a deck-building game where you’re trying to buy Hero and Construct cards to help you earn more money, victory points (glory or some such silly name for it), while you defeat monsters that pop up. It’s simpler than Dominion (less choices) so depending on your mood it may or may not get the nod when reaching for something off the shelf. Taking a quick break after eating a quick bite, I taught Cities to everyone. Cities is a 2-4 person “solitaire” game (there’s no direct conflict between players) of trying to maximize points based deciding where to place a tile in your city. Very simple game and mostly an activity more than a competition. We closed the night with 7 Wonders. Lisa has played many times but the other 5 players were new to the game. It may not look it, but 7 Wonders is a great family game. Don’t be put off by its complex appearance. It’s actually very easy to learn, it plays very fast, and there’s very little down time between “turns”. Unlike most games, adding more players does not slow the game down so the experience with 3 feels very much like the experience with 7. Thanks CABS for putting on ATD-2011. We’re already looking forward to it next year. 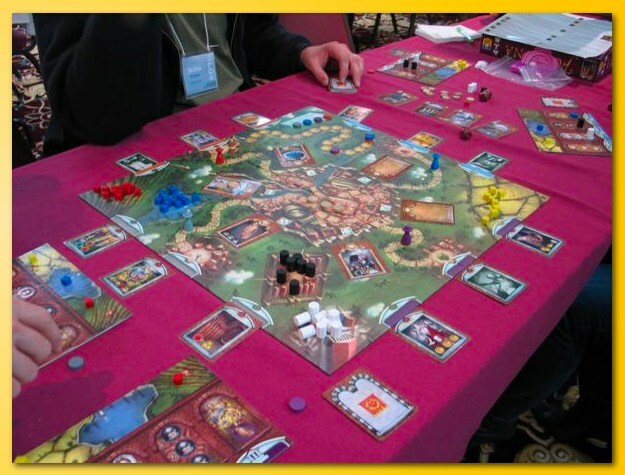 Alhambra is a 2003 title designed by Dirk Henn. I’ve owned it for years and felt it was a so-so game but after realizing I’d played it wrong, I wanted to get it back to the table. Unfortunately, the box kept getting pushed to the back of the game shelf to gather dust on its plodding journey to the trade list. 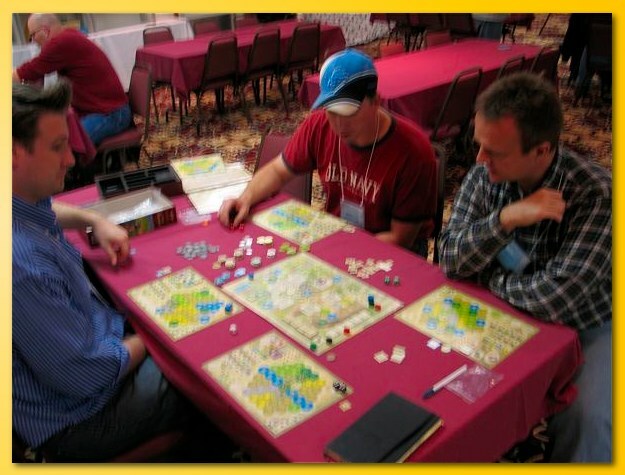 However, at a recent Great Lakes Games gathering, I had the opportunity to play it near the end of the convention and (of course playing it correctly this time) I had a great time. The game moved along faster than I remember and although there aren’t major decisions to be made, there are enough to keep it interesting. There is a place and time for real brain burners where most of the time is spent in silence analyzing the ebb and flow of strategic and tactical moves of sparring opponents but there is also a place and time for games that, rather than burn, apply a salve to the tired brain, possibly teasing out a bit more fun than work. 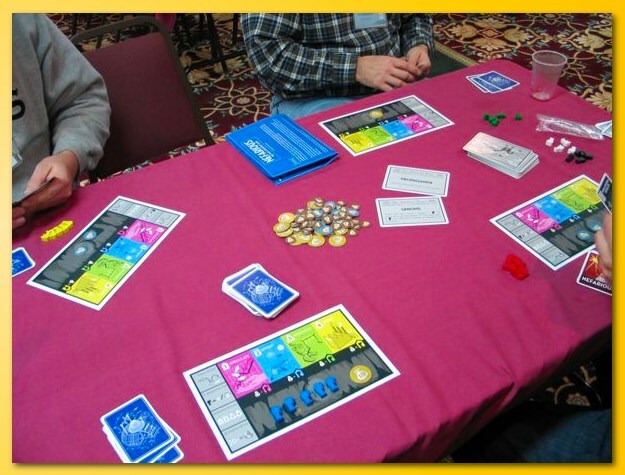 The game is simple, featuring a four-stalled market placed in the center of the table with each stall containing one tile (pulled randomly from a bag) and four face up cards (money). The cards come from a deck of 4 suits (matching the 4 stalls in the market). On your turn you either take cards from your hand, all matching the suit of the market stall to buy the tile in the stall, or you take one of the face up money cards. Every time you pay exactly what the tile costs (putting the cards in the discard pile) you get an extra turn. The first time you take a money card or overpay for a tile (there is no change) your turn is complete. You are allowed to take two face up money cards if both have a value less than 5. After buying tile(s) you place them in your personal Alhambra in front of you adhering to some relatively simple rules. Turn order is strictly clockwise so with less people you can plan for gathering money to grab that juicy market tile. With more players the less you are able to plan for the state of the market by the time your turn arrives. At the beginning of the game the money deck is split into roughly 5 equal piles and a scoring card is shuffled into the 2nd and 4th piles and then the piles stack on top of one another. When a scoring card is pulled up to replace a card in the market, the game pauses and everyone scores their Alhambra. The tiles depict different colors and you determine majority in colors, look up values on a chart and assign points. In the 1st round only 1st place scores. In the 2nd round points are awarded for 1st & 2nd place. 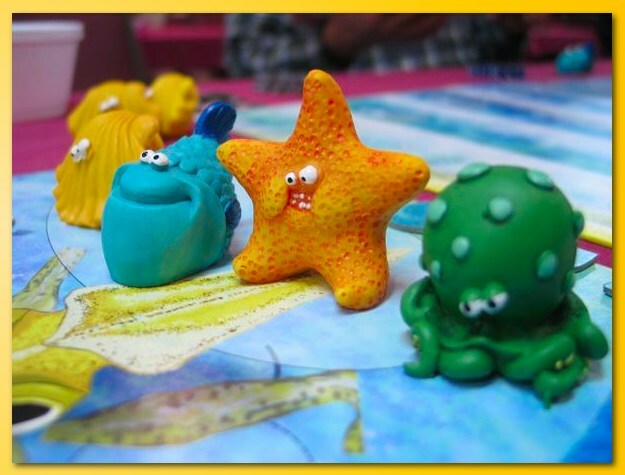 The 3rd scoring round occurs when the last tile is pulled from the bag and points are awarded for 1st, 2nd, & 3rd. In addition, each round affords each player points according to the length of the longest contiguous “wall” (dark border on the tile) that follows the outside of the Alhambra. In last night’s game, I managed to complete a perfect wall around my Alhambra with no gaps (see above). Very lucky. I’m glad I got the opportunity to play Alhambra at GLG because it saved it from the trade pile. I’ll be looking to play it more often in casual settings. Great Lakes Games 2011 has come to a close and I’m back home with the post-board game convention blues. I played 22 games over the 3 day period, 15 of them were new to me. My brain is fried but I’m already looking forward to next year. I felt like I played relatively competitively getting second many times and first a few times but as the hours of each day waned my brain became more and more mushy. Even simple games that I would usually play respectably were tough. However, I was still happy to play them with great people. Of the games I don’t already own, the definite buys for me were Die Burgen von Burgund, Vanuatu, and Hawaii. 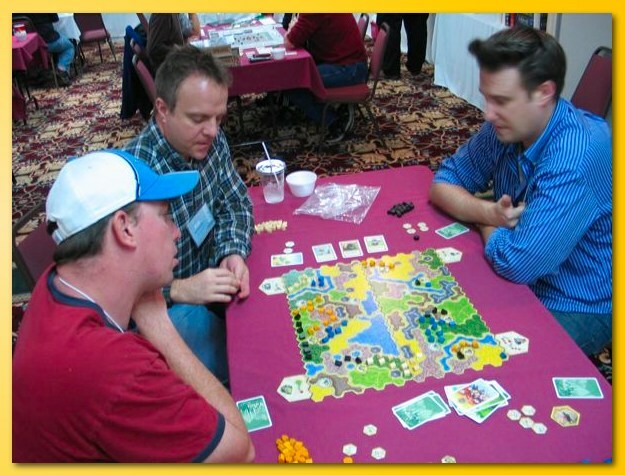 The potential buys were Kingdom Builder, London, Quebec, and San Marco. The games I won’t be buying were Fortuna, Poseidon’s Kingdom, Nefarious, Moongha Invaders, Keltis, and Aton. If you’d like to hear additional thoughts on a specific game, feel free to contact me or leave a comment. Well, it’s only 365 days left and counting until GLG 2012 begins. Getting out of bed on Saturday morning was rough. 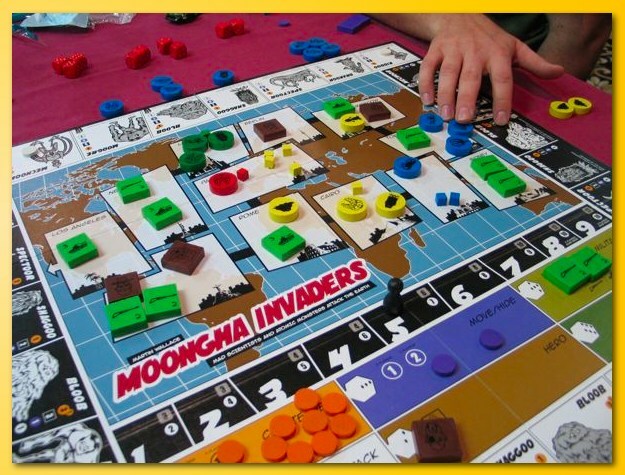 I got up late and after grabbing some breakfast I sat down to a game of Moongha Invaders, an odd Martin Wallace game of monsters invading cities around the world. 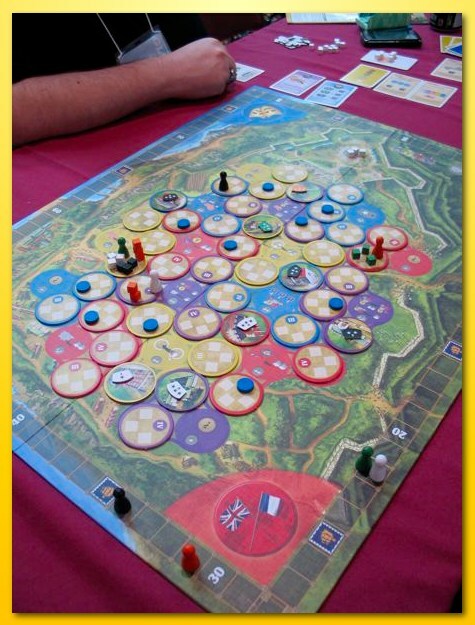 It’s a pretty light-hearted battle game with some recognizably eurogame mechanics. From what I understand there were only 600 copies of the game made so they go for crazy amounts of money. I’m glad I got to play it and the collector in me would like a copy but I suspect it wouldn’t see a lot of play time. 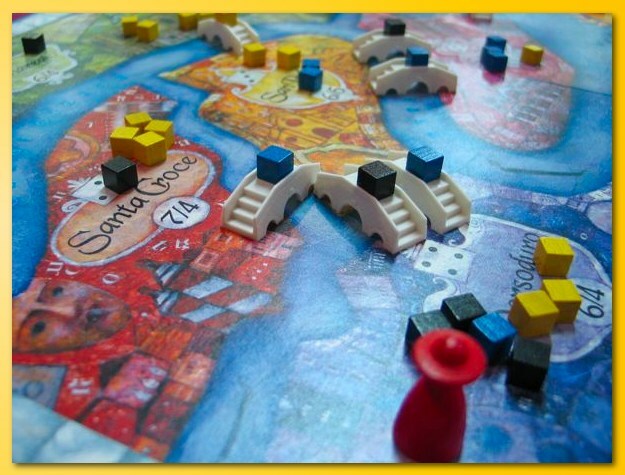 Quebec was another game on my must-play list and although I liked playing it, I’m wondering if I should buy it or not. 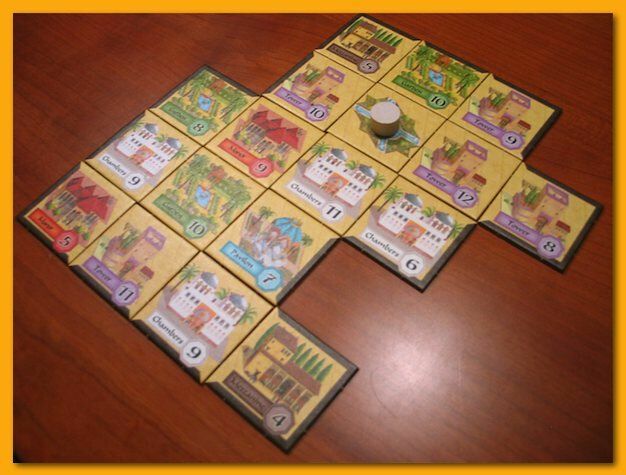 The game lasts four rounds and players try to build buildings by contributing cubes (workers) to the construction process. 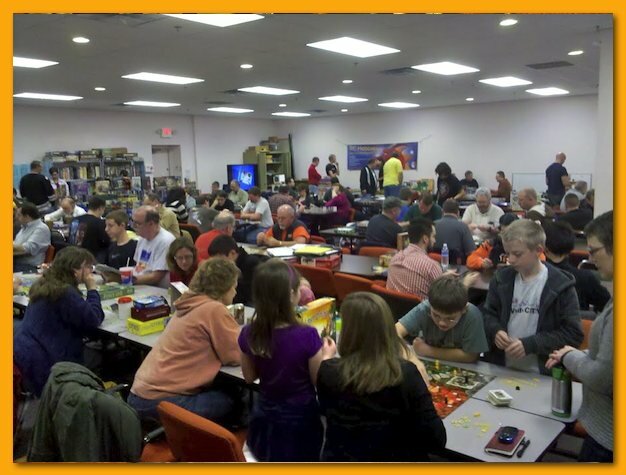 Once a player leaves one building and starts building another building, the contributed cubes move to regions of the board where a round ending majority scoring process takes place. There are lots of other things going on but it’s basically an area majority, cube pushing game. Next up was Fortuna. I wasn’t fond of the game but it’s rated relatively high on BGG. It’s not that it’s bad per se but there’s just not much to hang your hat on. Players attempt to take the actions on a limited set of cards in order to move a pawn up a track. Move far enough and you trigger the end game. There are cubes, cards, buildings that afford players special actions, dice, and various other things but it all seemed a rather bland game. The artwork is awesome but the game…meh, not so much. I participated in the annual GLG prize table and managed to walk away with a copy of Ninjato. We’ll see how it goes. I was involved with several lighter games as the night went on including Bottle Imp, Kingdom Builder, Maus au Chocolate, Dicetown, and closed the night with the card-game form of Keltis (a semi-reswizzled form of Lost Cities). Thanks to the time change, it’s now only 2:30am so hopefully I’ll be able to get up in time to still get breakfast in the lobby. I’m looking to grab a least one more short game tomorrow morning (so that I can claim to have played more games this year than last) and then hopefully stay awake for the three hour drive home. We started off with Vanuatu. 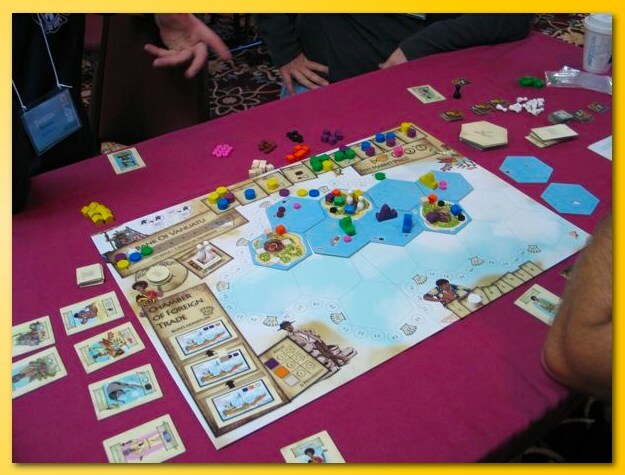 This game features a really neat mechanism where players use worker placement to take actions to move your boat around between islands and ocean that come out as the game progresses. You build huts, fish, dive for treasure, sell fish, creating art for the tourists, fly tourists to the islands, fight for start player, etc. The order that you take these turns is relatively ingenious, having players vie for a plurality in the action “boxes”. You might try to program the order of moves you want but other players can thwart your plans and not allow you to take your actions in the order you expected. This game is a must buy for me. It’s on the thinky and last a couple of hours but I really enjoyed it. Next up was Automobile. It’s a standard Wallace game so there are penalty cubes, loans, and variable turn order as players vie for building car factories, producing cars, and selling them. However, it’s not that easy to be efficient and build the right models of cars in the desired numbers to meet a fluctuating demand. Not my favorite game so I’m thinking about putting my copy up for trade. While others jumped out for some lunch we played a two-player game of Confusion: Espionage and Deception in the Cold War. It’s the goofiest title ever for such an abstract game. Players face off with chunky tiles on a chess board and your goal is the move your pieces to the middle of the board, pick up a little “briefcase” tile, and transport it to the other end of the board. However, at the start of the game you don’t know how your pieces can move and you must deduce their allowed movements by trial and error. 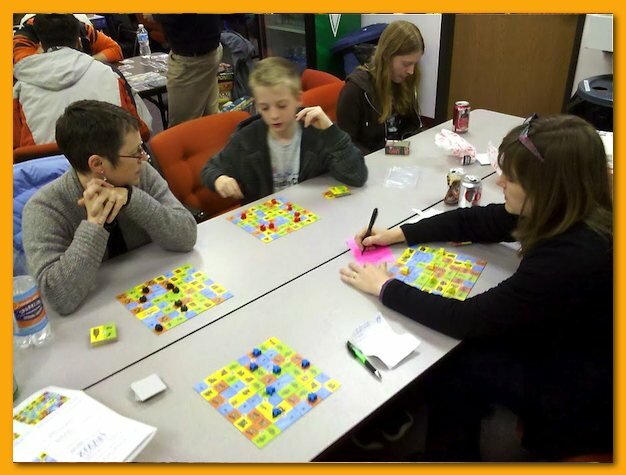 Your opponent can see how your tiles can move and must validation or invalidate your attempts to move the piece. At one point I thought I wanted to pick up a copy but I’m glad I waited to give it a test run. 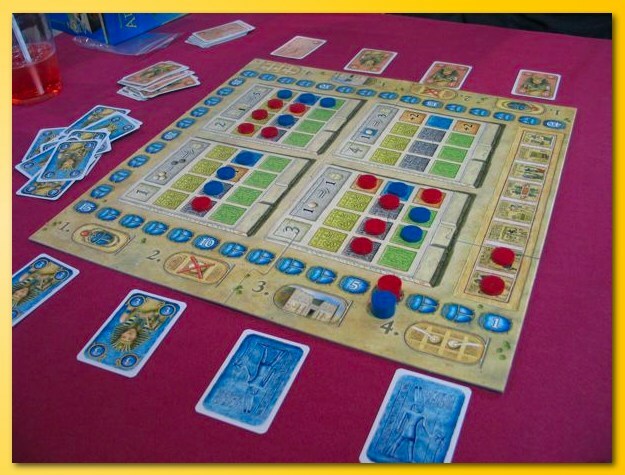 Aton is a quick little, older, two player game that we knocked off before heading into the next Essen title. Hawaii is a fun game that’s got a lot of familiar mechanics wrapped up in some nice variability from one game to the next. 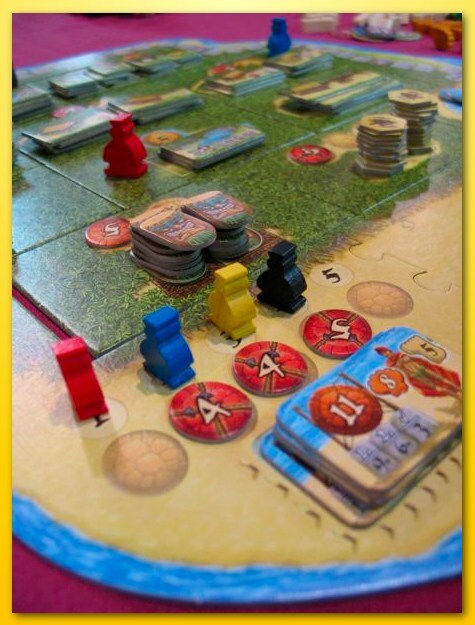 Players gather “feet”, shells, and fruit and use them to travel around a variably set up board buying buildings and other items that are placed on a “Vikings-like” tableau. You must build enough in each row to extend past a scoring limiter. The game is a bit fiddly to set up but it’s manageable. I had a lot of fun playing and it’s pretty high on my want list now. 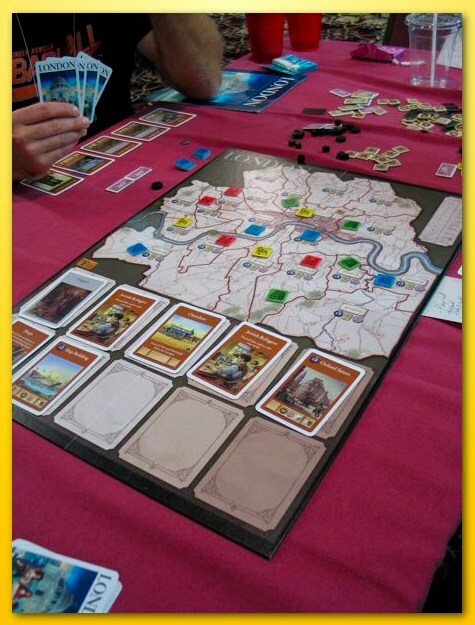 We next sat down to a copy of London, a St. Petersburg-ish feeling game of collecting cards and playing them onto your tableau and activating them to score points. Quintessential Wallace, the game includes “poverty” cubes and loans (although no variable turn order). I found it interesting but potentially a bit too much like (in feel) to St. Petersburg. Everybody headed to bed, and I should have too, but we stayed up and played Kingdom Builder one more time. It’s almost 4am and I really need to get to bed. My brain already feels like mush. Whew! It’s finally here. It’s almost 2am and I’ll need to keep this short so that I’m not too burned out tomorrow. We arrived at about 1:15pm, checked into our room and grabbed a quick lunch at Bob Evans just down the street. We rushed back to the conference room and quickly got into a game of Die Burgen von Burgund. Sorry for the very blurry picture but that’s all I’ve got to show for it. I was looking forward to playing this game and really liked it. There’s a lot going on but luckily Josh Miller sat with us and taught it. 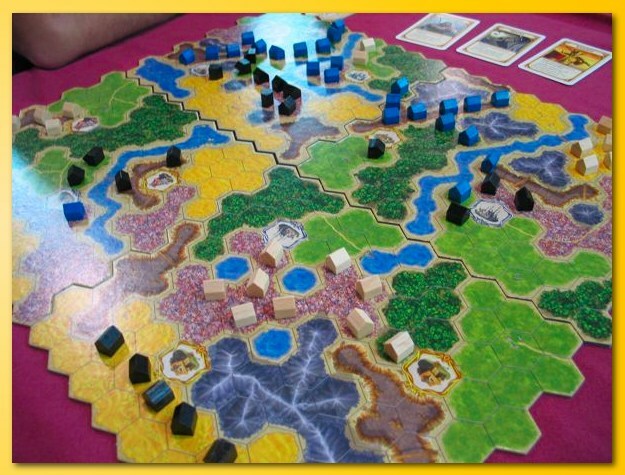 The game is basically a set collection game with tiles that you gather from a central board and eventually place them into your kingdom. You use dice to determine the two actions on your turn and you’re looking to gather tiles that when played allowed you to chain actions together giving you the most points from your action buck. Like I said, lots going on but a very neat system. Lots of different boards keep things variable and interesting from one game to the next. Definitely on the buy list. Next up was Poseidon’s Kingdom. The cute bits deceive you into thinking it’s a child’s game but wow, are the rules a challenge. In the end it’s relatively simple but still overly difficult for what’s really going on. You basically collecting dice that fall onto the board when the circular wave tips onto the board while you avoid the roaming shark. You use collected dice to “buy” points and “free your friends” from the Kraken. The Kraken Track is a bizzarre feature that speeds up the game (thankfully). At $100+ dollars…yeah….ain’t happening. Next up Kingdom Builder. Some say it’s like Through the Dessert but I think they must be smoking crack. True, you place a number of huts on the board and you’re trying to score points by doing it, but limitations on where you can place your huts and the goals you shoot for while placing them is phenomenal for such a simple concept. The variable boards you use plus the goal cards dealt at the beginning of the game will keep this game fresh for a very long time. A definitely buy. Next up was a filler called Nefarious. You’re trying to score points by “building/buying” inventions; a couple of cards dealt try to keep the game fresh from one play to the next. Mix in some 7-Wonders style adjacent player rules related to earning money on how accurate you are at guessing what they’ll play and you’ve got a game that moves very fast and can be over before you feel like you’re even out of the box. To close we played and oldie San Marco. I was not kind to San Marco in the past due to the down time on the card distribution phase but it wasn’t bad at all in our game. We played with three so the splits felt very painful. The game features an I split, you choose mechanism where cards are dealt and one player splits them into “offerings” and the other players pick them leaving one last offering to the person that performed the split. The cards allow you to perform actions on a board that play out much like a simplified El Grande board scoring points for the player with the most in an area and to the player who has the second most. I enjoyed it this time and would play ago. That’s all I’ve got time for. It’s getting very early. Looking forward to a lot of games after a few hours of shut-eye.